Radiation of all kinds can cause damage to the body’s tissues and cells, and can lead to the development of abnormal cell development or cancer. People often wonder are dental x-rays safe. However the dose of radiation required for dental x-rays is extremely small. This is fantastic news as it is certainly sensible to keep our exposure to x-ray radiation ALARP (As Low As Reasonably Possible). We are exposed to daily radiation from the sun, from appliances we use daily, from minerals in soil and even in food. Advances in technology have allowed modern dentistry to lead to the extremely low radiation levels used today. 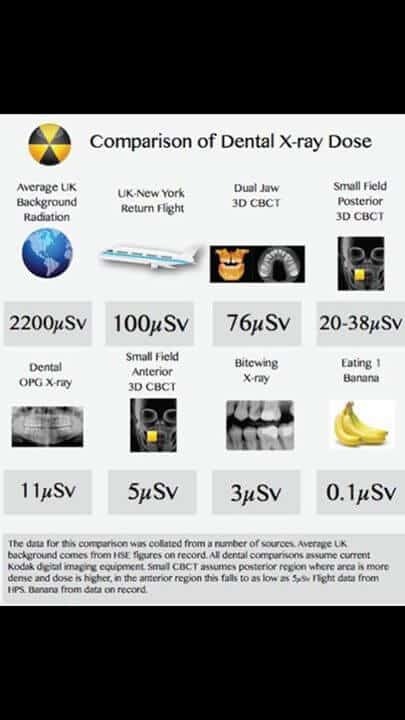 Check out this chart showing comparable exposures of radiation and explained how safe dental x-rays are. Dental Radiation Chart – giving some rough examples of comparable exposures. That’s right, even eating a banana contributes to radiation exposure! Ultimately the radiation from Dental x-rays is minimal due to advances in modern technology. In addition the hard nature of the tissues being examined also allows for lower dosages to be used. Remember to keep your exposure levels as low as reasonably possible (ALARP) but if you do need some preventative or informative x-ray films, the dose required is minimal compared to daily exposure. Dental x-rays are very safe, and provide amazing information to help prevent and treat dental disease. There have been significant advances in dental technology allowing already low doses to be reduced even further. 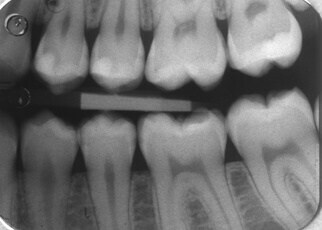 You should feel safe undertaking dental x-rays. Of course if you have an concerns just ask your friendly dentist! Australians Drink Way Too Many Sugary Drinks! There are many reasons that a Dentist may take a X-ray. Some people have specific issues that need to be monitored closely, which may mean frequent low dose x-rays need to be taken. For other people annual or bi-annual films are more than enough. To answer your question, it certainly is NOT unusual… however it might be worth you having a chat with your friendly dentist and just ask the question!